Menopause brings on a number of biological changes, and in addition to the obvious hormonal changes, you might also notice a difference in your body shape. Body fat previously found only on your lower body, such as on your hips and thighs, can begin to appear in your midsection, causing stomach fat. You'll need to undergo a few lifestyle changes -- including tweaks to your diet and starting an exercise program -- to lose your stomach fat. The belly fat you can gain after menopause doesn't affect only your appearance, it can also increase your risk of disease. Post-menopausal women tend to gain stomach fat as visceral fat, which is fat found within your abdominal wall. This type of metabolically active fat surrounds your internal organs and pumps out inflammatory substances. That spells bad news for your overall health, since chronic inflammation contributes to heart disease. Here's the good news -- that deep-belly visceral fat is among the first fat you'll burn when you start to lose weight. To do that, eat fewer calories than you burn each day. For example, a 5-foot tall, 50-year-old woman who weighs 165 pounds and lives a sedentary lifestyle can maintain her weight with 1,815 calories. She could reduce her intake to 1,565 calories daily to lose half a pound per week, or eat 1,315 calories to lose 1 pound weekly. Don't reduce your calorie intake as much as possible -- it won't speed up your weight loss. In fact, eating fewer than 1,200 calories could put you into a semi-starvation state, ultimately slowing down your metabolism. Focus on nutritious foods while on your weight loss diet so that you make every calorie count. This has two benefits -- it helps ensure you're meeting your vitamin and mineral needs -- and because nutritious foods tend to be more filling than "junk" -- you won't feel hungry and deprived. This means you should fill up on vegetables at every meal; include fruit in your meal plan; choose nutritious sources of fat, such as avocado, olive oil and nuts; and choose lean proteins such as beans, poultry and fish. Emphasize healthy foods that provide lots of calcium -- such as nonfat dairy, as well as broccoli and leafy green vegetables -- since a diet high in calcium is linked to a lower risk of excess visceral fat. Burning stomach fat also requires doing cardiovascular exercise. Increasing your activity level with exercise means you'll burn more calories each day, which will help you lose more weight. Prepare for a significant time investment -- you need at least 250 minutes a week of moderate-intensity exercise for significant weight loss, according to the American College of Sports Medicine. 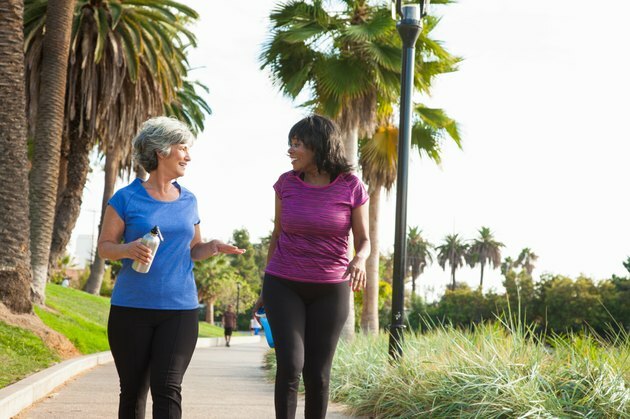 That doesn't mean you need to spend endless hours on the elliptical or treadmill -- a simple brisk walk around your neighborhood counts as moderate-intensity exercise. Other low-impact cardiovascular exercise, such as water walking or water aerobics, can also help you burn calories if you don't want to stress your joints with higher impact workouts like running. Strength training after menopause is a key for good health, and it can help keep stomach fat away, too. Resistance training builds muscle tissue and, because muscle takes more energy to maintain than fat, this increases your daily calorie burn. The hormonal changes that occur during menopause affect several tissues in your body, including your bones, and post-menopausal women face a higher risk of osteoporosis. Strength training can maintain your bone density to help prevent osteoporosis, and might even slightly reduce bone loss and increase bone density, according to fitness expert Len Kravitz, Ph.D., writing for the University of New Mexico. Consult a fitness professional for help designing the best strength training program for you -- your mobility, flexibility, balance, strength and body shape all affect which exercises will be safe and effective, and a professional can also ensure you're lifting weights with the correct technique to avoid injuries.